A kind stranger once told me, “There’s a special place in heaven for mothers of three boys.” I choose to believe that this legend is true. I’ve been parenting three boys for over a decade and I’m really looking forward to that heavenly rest. Whether or not you believe in the white clouds of heaven, here are 11 things all mothers of boys know to be true. In the first few weeks of your baby boy’s life you will learn to be ‘at the ready’ as soon as the nappy comes off. Because as soon as it comes off, DUCK AND COVER! There is a ground to air missile hidden inside with your face in its sights. The rim of the toilet, the tiles around the toilet, the back of the toilet and even the space behind the toilet are all places where your little boy will manage to spray wee. It’s admirable really, the coverage that he is able to get from one small appendage. During these times, a cloth nearby is your greatest ally. Keep it handy in the bathroom, wipe, rinse and hang to dry. It’ll be ready for the next time you need it, which will be about an hour later. As a payoff for the bathroom thing above: if they need to go, all you need is a tree. (Number ones only, obviously!) This is also handy if you have a lemon tree in your backyard. Lemon trees love to be weed on, so send your little boy out to the backyard daily to fertilise the citrus. This will also save you a few ‘wipes’ of the toilet and its surrounds per day. If there is a large muddy puddle in your path, there is great joy to be had in stomping straight through it, boots and all. He won’t go around it, he won’t go over it, he will go straight through it and then turn around and do it again. 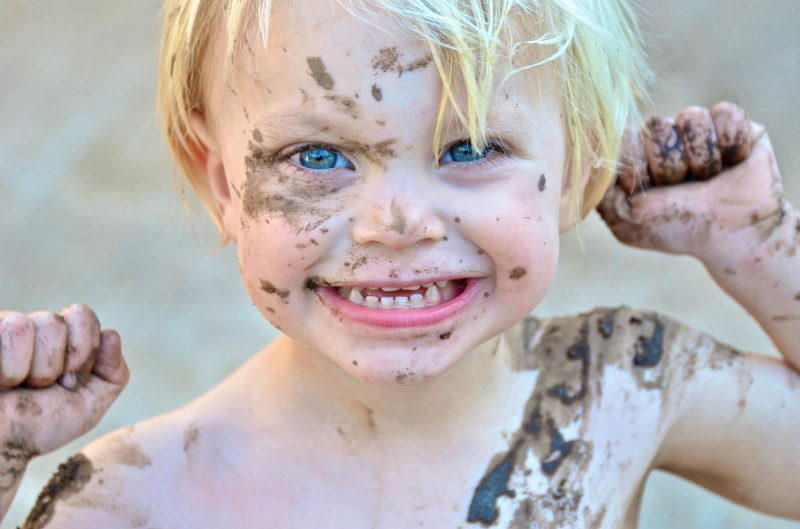 Dirt and mud and sand will wash away, but the good time had in the dirt and mud and sand will live on forever. Which is why mums of boys learn to sit back and let the dirtiness prevail while mums of girls look on in horror. If you have a little boy, the appearance of a new construction site in your neighbourhood heralds weeks of good times standing at the fence watching the diggers work. Get some emails done while you’re there. He’ll be quiet and still for the longest time. And there’s no playground soft-fall beneath that giant plane tree. So get used to it. As soon as a tree comes into view, he’s going straight for it and straight up it. All my boys are compulsive and expert tree climbers. With my first boy I was optimistically diligent about the ideological battle of wills that takes place between mother and son over guns and weaponry. “I will not allow guns in THIS house,” said I. My son had other ideas. By the time I had three boys, the house contained an arsenal of weaponry that would rival “The Supply Room” at Alexandria in The Walking Dead. I’m not proud of it; it’s just a battle we can’t win. Little boys don’t do ‘sitting still’. They are bundles of unspent energy and every day you need to get them out of the house to run around in circles and expend that energy lest they take it out on the couch and curtains. The requirements of family life have never been so beautifully crystallised. Boys in particular need to crawl, climb and clamber CONSTANTLY. Just give yourself over to it, let the couch be a jumping castle and your life will be so much easier. Sticks are not sticks, they are swords and lightsabers and rifles and myriad other things that need to be waved and swiped through the air in a frenzy of testosterone. When they are found at the park, they must come home with you and be given pride of place in the bedroom.